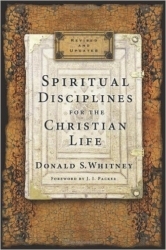 Donald S. Whitney Changed how Christians approached the Spiritual Disciplines with the original release of his classic, bestselling Spiritual Disciplines for the Christian Life. Whitney draws from a rich heritage of godly believers from christian history, guiding readers through a carefully selected array of disciplines including Scripture reading, worship, silence and solitude, journaling, and more. He shows how the Spiritual Disciplines, far from being legalistic, restrictive, or binding as they're often perceived, are actually the means to unparalleled spiritual liberty. Updated and revised to equip a new generation of readers, this anniversary edition features in-depth discussions on Bible study and prayer, including methods for praying through and meditating on Scripture. By illustrating why the disciplines are important, showing how each one will help you grow in godliness, and offering practical suggestions for cultivating them on a long-term basis, Spiritual Disciplines for the Christian Life provides you with a refreshing opportunity to embrace the pursuit of holiness through a lifelong delight in the disciplines. 2. Bible Intake - Part 1. 3. Bible Intake - Part 2.